The seed habit is the most complex and evolutionary successful method of sexual reproduction found in vascular plants. Today, seed plants, gymnosperms ("Nacktsamer", ca. 800 living species) and angiosperms ("Bedecktsamer", flowering plants, ca. 250000 living species), are by far the most diverse lineage within the vascular plants (see figure below). Most of this diversity is accounted for by the angiosperms and Charles Darwin described the rapid rise and early diversification within the angiosperms during the Cretaceous time as 'an abdominable mystery' (see 'angiosperm seed evolution'). The seed plants have an adaptive advantage, occur in a wide variety of habitats and dominate today's flora. This evolutionary success is, at least in part, due to the seed, which is one of the most dramatic innovations during land plant evolution. Morphological evidence for the monophyly of seed plants includes the seed habit itself, but also include vegetative traits like the production of wood by cambium, a secondary meristem. The origin and evolution of the seed habit is a fascinating story by that started in late Devonian times about 385 MYBP (see figure below). To understand the seed, it helps to think about how it evolved and what it essentially is in terms of origin and function. (1) The evolution from homospory to heterospory and connected with this from megasporangia with many spores to megasporangia with just one functional megaspore. (2) The evolution of the integument, maternal tissue that protects the ovule; the integument forms the seed coat. (3) The evolution of pollen-receiving structures. This includes the transition to water-independence of the pollination/fertilization process (water is required for fern fertilization). Today there are four major lineages of extant gymnosperm seed plants: Cycadopsida (cycads, "Palmfarne"), Ginkgopsida (ginkgos), Pinopsida/Coniferopsida (conifers, "Nadelbäume"), and Gnetopsida (gnetophytes). Extinct gymnosperm groups include the Lyginopteridopsida (seed ferns, Pteridosperms, "Samenfarne", paraphyletic group including Devonian/Carboniferous Lyginopterids and Carboniferous/Permian Medullosans), Bennettitales (cycadeoids), Gigantopteridales (gigantopterids), Pentoxylales (e.g. Pentoxylon), Caytoniales (e.g. Caytonia), Glossopteridales, Voltziales (e.g. Emporia), and Cordaitales (see figure below). The evolutionary connections between these gymnosperm groups are uncertain and especially the position of the Gnetales is a matter of controverse debate. Based on molecular (DNA sequences), morphological (including fossil seeds), and biogeochemical evidence (oleanone) the different gymnosperm groups are either monophyletic or paraphyletic, and their evolutionary relationships to the angiosperms are unclear (for a recent review see Bateman et al. 2006). Anthophyte hypothesis: Virtually all morphology-based cladistic analyses propose a monophyletic group consisting of angiosperms + Bennettitales + Pentoxylales + Caytoniales + Glossopteridales + Gnetales (= anthophytes). This implies that the Gnetales are sisters of angiosperms and the gymnosperms are paraphyletic. This hypothesis is not supported by molecular data, which place the Gnetales as sister to all remaining seed plants, and in several molecular analyses even within the conifers as sister to Pinaceae. Based on many molecular analyses, the gymnosperms are a monophyletic sister group of angiosperms. Among several other possibilities, the Caytoniales, Pentoxylales, Glossopteridales, Bennettitales and Gigantopteridales have been proposed as ancestors of the angiosperms. 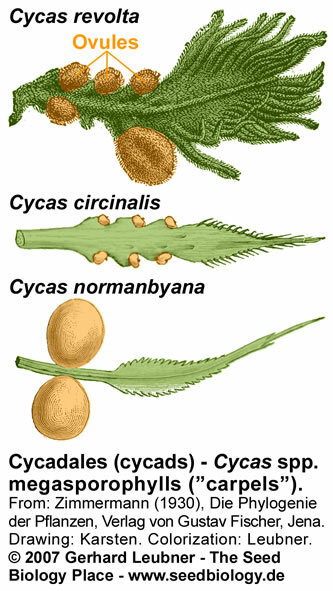 Gigantopterid hypothesis: The Bennettitales (cycadoeoids), which are morphologically highly similar to the Cycadopsida (cycads), are a group of gymnosperms that are highly similar to angiosperms. Oleanane, a triterpene important for insect defense is widespread among angiosperms, has been discovered in fossils of Cretaceous Bennettittales (cycadoeoids) and Permian Gigantopteridales (a diverse group of probably unrelated gymnosperms related to cycadoeoids, cycads, and angiosperms; www.gigantopteroid.org), but not in other gymnosperm groups (Taylor et al. 2006). The gigantopterid hypothesis claims that the angiosperms derived from seed ferns via cycadoeoid-related gymnosperms (gigantopterids). Note that at the present time the issue of seed plant evolution remains unsolved. A seed consists of an embryo, stored food and a seed coat. The seed replaces the spore of the seed-less fern plants as propagation, dispersal and deposit/outlast/storage unit. Ferns and seed plants both exhibit a life cycle in which two heteromorph generations alternate: (1) The dominant diploid sporophyte, which is the fern or spermatophyte plant that you actually see as the 'large-sized' organism in nature; and (2) the haploid gametophyte, which for the ferns is the small-sized (few mm to few cm) prothallium of ferns that you might see in nature if you search for it. In the seed plants the haploid gametophytes became a 'hidden generation' that completely depend on the sporophyte, it was hidden to us until Hofmeister discovered the alternation of generations in seed plants in 1851). In seed plants the male gametophyte (microgametophyte) is hidden in the pollen grain ("Pollenkorn") , and the female gametophyte (megagametophyte) is hidden in the ovule ("Samenanlage"), after pollination and fertilization the ovule develops into the seed. Angiosperm and gymnosperm gametophytes and seeds are distinct. To understand the angiosperm seed, it is necessary to understand the gymnosperm seeds, and how it evolved from seed ferns and progymnosperms. The gymnosperms have 'naked seeds', i.e. their ovules and seeds (fertilized ovules) are exposed on the surface of sporophylls and analogous structures. The megagametophyte (female gametophyte, n) develops from the functional megaspore (n) within the nucellus (megasporangium, 2n). The megagametophyte of the gymnosperms is homologous to the megaprothallium (n) of the ferns and is sometimes called primary endosperm (n). The megagametophyte of seed plants is retained and nourished by the parent plant within the ovule. Ovule = megagametophyte + megasporangium (nucellus) + integument (seed coat). The megagametophytes of the gymnosperms produce several archegonia (n) with egg cells (n). Fertilization by the sperm from the pollen grain (microgametophyte, male gametophye, n) often leads to the development of several embryos (2n) within a single ovule. Polyembryony of gymnosperm seeds is a known phenomenon. In most cases only one embryo survives and therefore relatively few fully developed gymnosperm seeds contain more than one embryo. In contrast to the gymnosperms ("Nacktsamer"), the angiosperms are "Bedecktsamer", i.e. their ovules and seeds are enclosed inside the ovary, which is the base of a modified leaf and is called carpel. Another very important difference to gymnosperms is the angiosperm double fertilization. This leads to an additional novel tissue with maternal protuberance, the triploid endosperm. In mature seeds of most angiosperm species, the embryo is enclosed by endosperm tissue. In addition, angiosperm seeds can be dispersed as fruits, i.e. the seeds can have in addition pericarp (fruit coat) around the testa (seed coat). The Triassic and Jurassic age was dominated by gymnosperms, although the first angiosperms evolved during at this time. The rapid rise and early diversification of the angiosperms occurred during the Cretaceous time and was called 'an abdominable mystery' by Charles Darwin. The earliest seed plants emerged in the Devonian, and have been called "progymnosperms". 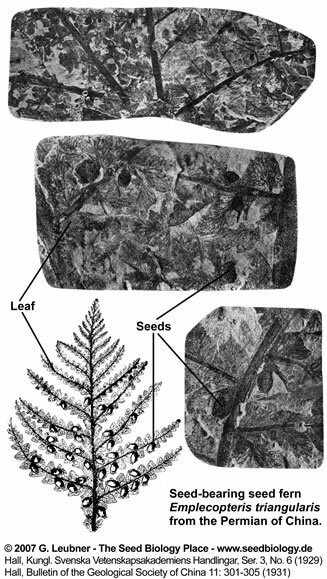 Progymnoperm fossils show vegetative morphologies to gymnosperms: They were shrubs or trees with laminate leaves, but reproduced by spores like ferns. They had a bifacial vascular cambium that produced secondary xylem (wood with pitted tracheids) and secondary phloem. The progymnosperm Archaeopteris spp. was the first modern tree, but it produced spores rather than seeds. However, it exhibited an advanced system of spore production called heterospory. Heterosporous plants produce two sets of specialized spores: megaspores (haploid female-like megaspores) and microspores (haploid male-like microspores). Heterospory, which has been evolved independently in several lineages, is widely believed to be a precursor to seed reproduction. Thus, both the production of wood and heterospory predate the evolution of the seed. The progymnosperm groups of Archaeopteridales and Aneurophytales are regarded as the ancestors of the seed ferns and seed plants. The oldest fossils of ovules ("Samenanlagen") or seeds (fertilized, mature ovules) are from the late Devonian (>365 MYBP, Runcaria even 385 MYBP). The earliest seed plants with seeds or seed-like structures are Devonian seed ferns (Lyginopteridposida, Pteridosperms). Several different types of preovules or preovule-like structures are known. Not all characteristics of the seed habit (heterospory, a single megaspore within a megasporangium (nucellus), megasporangium enclosed by an integument, pollen capture before seed dispersal) are evident in these preovules. Runcaria (Gerrienne et al. 2004), the oldest seed-bearing seed fern (Middle Devonian, 385 MYBP) had a small, radially symmetrical, integumented megasporangium surrounded by a cupule. The megasporangium bears an unopened distal extension protruding above the multilobed integument. This extension is assumed to be involved in wind pollination (anemophily). Runcaria sheds new light on the sequence of character acquisition leading to the seed. In general, a seed is simply a mature ovule containing an embryo. An immature ovule consists of a diploid megasporangium (nucellus), containing a single functional megaspore that develops into a haploid megagametophyte. The megasporangium is surrounded by diploid covering layers, the integuments (which evolve into the seed coat). An integumentary opening at the apical end is important for pollination, wind pollination in seed ferns and modern gymnosperms; this opening evolved into the micropyle. 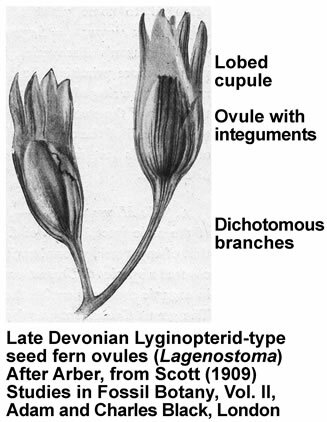 The Late Devonian and Early Carniferous seeds ferns are sometimes collectively called Lyginopterids and include Elkinsia, Archaeosperma, Lagenostoma, Moresnetia, and Lyginopteris. 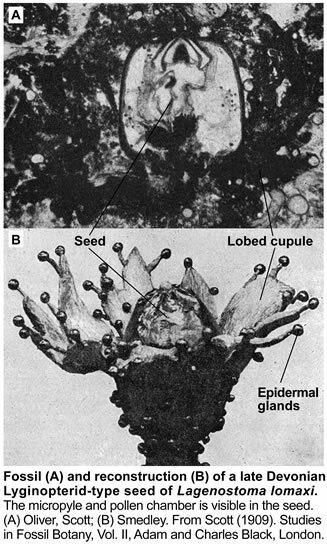 These earliest seed-bearing seed plants produced their preovules or ovules on dichotomously branched, sterile structures called cupules (see figure on the right). Cupules are cup-like structures that partially enclose the ovule. In these early ovules the nucellus was surrounded by integumentary tissue consisting of more or less free lobes. The integumentary lobes curved inward at their tips, forming a ring around the apical end. The integuments of the ovules evolved through gradual fusion of the integumentary lobes. The integuments later evolved into the seed coat. An opening that was left at the apical end, evolved into the micropyle, it permitted pollen to enter and to fertilize the egg cell. The earliest seed plants employed "hydrasperman reproduction". Pollination occurred when wind-blown pollen was directed into a semi-closed pollen chamber. In several cases a specialized lagenostome was used for pollen capture. A lagenostome is a funnel-like structure of the nucellus that projects from the top of the megasporangium, it functions as a trumpet-like pollen-trapping device. From there the pollen was delivered to the pollen chamber. A central column (lagenostome column) was attached to the pollen chamber floor sealed the chamber to provide optimal conditions for pollen germination. As the megagametophyte matures the opening to the pollen chamber is sealed and the floor is ruptured, allowing fertilization to proceed. The germinated pollen grain (microgametophyte) settles into an intimate proximity to the ovule and delivers the sperm/spermatozoid (has cilia, swims, requires water) into the archegonia with the egg cells. Fossil records suggest that the sperm delivery required lysis of the megasporangium wall. The important issue was that pollination and/or fertilization became more water-independent during evolution, which facilitated the diversification of seed plants from Carboniferous through to the present day. So far, embryos have not been found in Devonian seed fern fossils. The seed ferns (Lyginopteridposida, Pteridosperms) are a paraphyletic group of extinct gymnosperms. 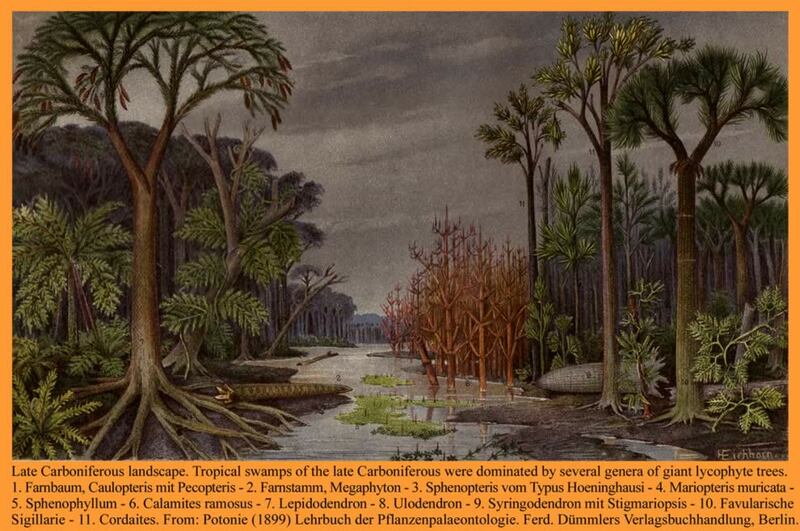 An interesting group, the "medullosan seed ferns" were abundant trees in Carboniferous floodplains end extend well into the Permian. This group includes Trigonocarpus, Pachytesta, Rhynchosperma, Medullosa and Stephanospermum. Fossil seeds from medullosan seed ferns (see figures on the left and below) are several mm to several cm long. In some cases even embryo structures have been preserved. The ovules are usually radiospermic, with one end of the integument drawn out into a micropyle that probably helped guide pollen to the megagametophyte within. A pollination drop mechanism may also have aided pollen capture. A small pollen chamber appears just inside the micropyle. This structure is preserved in detail in a number of Devonian and Carboniferous seed fossils. A loss of the cupule and a loss of the lagenostome column was evident in the medullosan seed ferns. The integument of Pachytesta and Stephanospermum is three-layered with an epidermis and outer fleshy layer (sarcotesta), covering a though fibrous (sclerotesta) and thin endotesta, which lays adjacent to the nuclleus (see figure on the left). In Stephanospermum konopeonus ovules (Drinnan et al. 1990) an apical funnel aided wind-blown pollen capture. Beyond the micropyle and tip of the sclerotestal beak, the sarcotesta flares open as a funnel that tapers to the micropylar opening at the tip of the sclerotestal beak. The rim of the funnel forms he broad apex of the ovule. The endotesta of Stephanospermum ovules is thin and lines the inner surface of the sclerotesta. 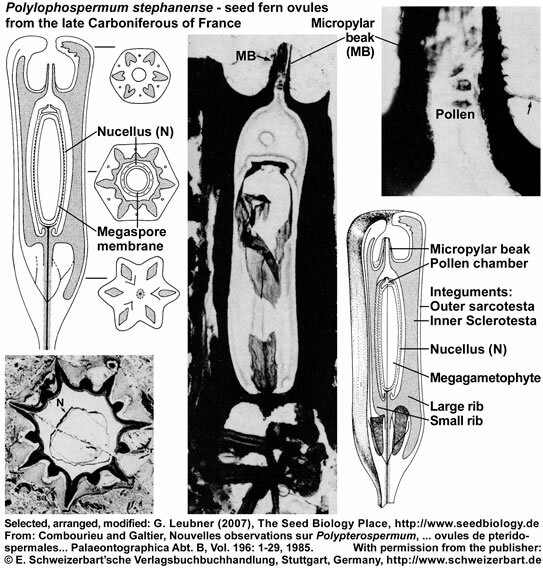 The nucellus and the megagametophyte are poorly perserved in the Stephanospermum ovule fossils. In these ovules, the nucellus may have consisted of only a few layers of thin-walled parenchyma surrounding the megaspore membrane. The nuclleus is attached to the integument only at the base of the ovule. The megaspore membrane is robust and consists of a distinctive network of granules and rods of sporopollenin covered by a homogeneous outer layer. Cells of the megagametophyte are not preserved from Stephanospermum ovule fossils. The seed ferns (Lyginopteridposida, Pteridosperms) are a paraphyletic group of extinct gymnosperms. Another interesting group with radiospermic ovules/seeds was deposited in the late Carboniferous (ca. 296 MYBP) in the Saint-Etienne basin near Grand-Croix, France. The figure below (it's use as part of "The Seed Biology Place" website was kindly permitted by the "E. Schweizerbart'sche Verlagsbuchhandlung, Stuttgart, www.schweizerbart.de") shows specimen and reconstructions of ovules/seeds of Polypterospermum renaultii and Polylophospermum stephanense (Combourieu and Galtier, 1985). The relationships of these ovules with the Medulloan seed ferns are discussed in this publication with regard to a large number of radiospermic seed genera found in association at the same locality. Polypterospermum renaultii is an ovoid seed, 3 cm long, hexagonal in cross section with twelve alternating large and small ridges ("wings") of the sclerotesta. A sarcotesta is absent, but an inner fleshy endotesta is described. The nucellus is variable in thickness and a dome-shaped pollen chamber is evident. A structure interpreted as pollination droplet on the nucellar beak contains numerous pollen. Polylophospermum stephanense is an elongated-cylindrical seed, 3 cm long, round to hexagonal in cross section with a smooth outer surface. The integument is differentiated into an outer parenchymatous sarcotesta and an inner sclerotesta with six prominent ribs alternating with six smaller ribs. A characteristic feature is the prolongation of the sclerotesta at each end of the ovule to form a basal extension and an apical chamber surrounding the long micropylar beak. The nucellus is attached to a conspicuous stalk and is apically differentiated into a thin-walled pollen chamber. Poorly preserved prepollen grains are present in the micropylar beak and the pollen chamber. Seed ferns with angiosperm-like features are known from the late Permin (Paleozoic seed ferns) and early Triassic (Mesozoic seed ferns). Several fossil examples of seeds attached to foliage were described by Halle (1929, 1931) from the Permian of China. This includes Sphenopteris, Pectopteris, Alethopteris and Emplectopteris. Specimens of Emplectopteris triangularis foliage were preserved with seeds attached (see figure on the right above the orange-framed figures), but nothing is known about the internal structure of the ovules. Sterile foliage of Emplectopteris triangularis type has been included in the Gigantopteridales. It has been proposed that in the evolutionary trend ranging from Emplectopteris through to the gigantopterids Gigantonoclea > Bicoemplectopteris > Tricoemplectopteris, as the leaf of this series becomes much reduced in size, the seeds attached to the leaf of the plants in later stages are subsequently much smaller than those of Emplectopteris. Even though the relatively larger seed of Emplectopteris may be recognized by naked eye at a first glance, the seed-bearing pinna specimens of Emplectopteris are still very difficult to obtain. This is also true for glossopterids and gigantopterids. The morphological leaf characters of gigantopterids are more similar to dicotyledonous angiosperms than those of glossopterids. Among several other possibilities, the glossopterids, gigantopterids, Caytoniales, Pentoxylales and Bennettitales have been proposed as ancestors of the angiosperms. Note that at the present time this issue of seed plant evolution remains unsolved. 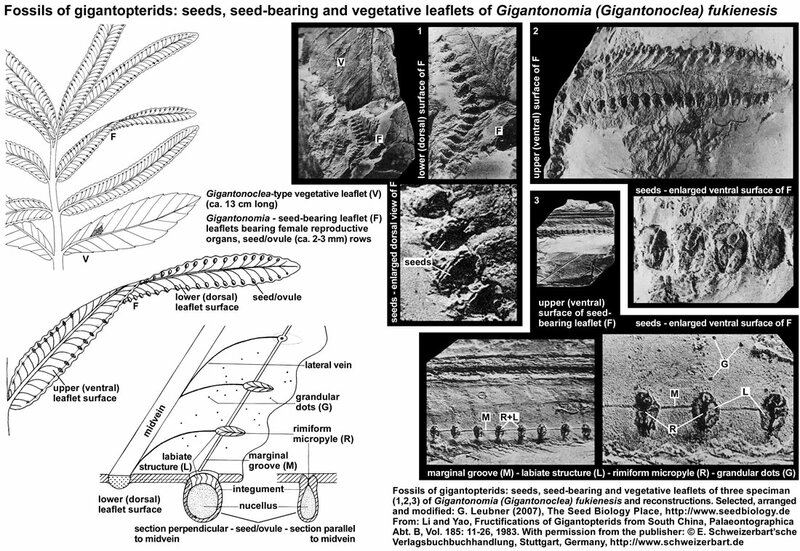 Seed-bearing leaflet fossils of gigantopterids: The gigantopterids are a group of plants very typical to the Cathaysia- or Gigantopteris flora. The figure below (it's use as part of "The Seed Biology Place" website was kindly permitted by the "E. Schweizerbart'sche Verlagsbuchhandlung, Stuttgart, www.schweizerbart.de") shows gigantopterid specimen from the Fukien Province in South China and their reconstruction. The authors (Li and Yao 1983) propose that the generic names Gigantonomia and Gigantotheca should be used to refer to specimen of female (seed-bearing leaflets, see F in figure below) and male (microsporangia-bearing leaflets) reproductive organs of the gigantopterid Gigantonoclea (vegetative leaflets, see V in figure below). In a seed-bearing reproductive leaflet (10-22 mm broad, >130 mm long) of Gigantonomia (Gigantonoclea) fukienesis the seeds are arranged in two rows, each borne on the slightly depressed centre of a marginal blunt apical lobe of the lower (dorsal) lamina surface at the end of the secondary vein. Seed structure: the cross-section shows that the seeds are elliptic, attached seeds are 2.5 mm x 1.5 mm in size and covered with glandular dots. Before the seed-bearing leaf reaches the mature stage, the rimiform ("having a long furrow") micropyle is covered with lid area, and the lamina where the seeds are situated appears to be slightly convex. When the seed-bearing leaf reached the mature stage, the lid area dehisces and an ovate opening forms for pollination, about 2 mm x 1 mm in size, and the obliquely labiate structure (micropylar seed end) connecting with the rimiform micropyle becomes visible. Seed attachment is below the rimiform micropyle, there is a pruniform body, probably the nucellar portion of the ovule, and a layer enveloping the nucellus-like body, probably the integument, extends upwards to merge gradually into the labiate structure. The isolated, unattached seeds are ovale to elliptic in shape, have an average size of 3 mm x 2.5 mm, and the surface is covered with fine striations and glandular dots. The microsporangia-bearing leaflets suggest that a tremendous quantity of microspores was produced. The morphological characteristics of the reproductive organs of gigantopterids is consistant with the hypothesis that they were wind-pollinated, though Permian insects became rather rich both in forms and quantities. The gigantopterids appear to be related to cycads and cycadoeoids. The "partial angiospermous character" of the gigantopterids is of great significance. It resembles more or less the reserved ovule of some angiosperms. Gigantopterid hypothesis: The Bennettitales (cycadoeoids), which are morphologically highly similar to the cycads, are a group of gymnosperms that are highly similar to angiosperms. Oleanane, a triterpene important for insect defense is widespread among angiosperms, has been discovered in fossils of Cretaceous Bennettittales (Mesozoic cycadoeoids) and Permian Gigantopteridales, but not in other gymnosperm groups. The gigantopterid hypothesis claims that the angiosperms derived from seed ferns via cycadoeoid-related gymnosperms (gigantopterid hypothesis: Asama 1982 (Bulletin of the National Science Museum, Tokyo, Series C, 8: 43-58); Li and Yao 1983; Taylor et al. 2006; www.gigantopteroid.org). Today there are four major lineages of gymnosperm seed plants: cycads (Cycadales, "Palmfarne"), ginkgos (Ginkgoales), conifers (Pinales, "Nadelbäume"), and gnetophytes (Gnetales). The gymnosperms have "naked seeds", i.e. their ovules and seeds are exposed on the surface of sporophylls and analogous structures (in contrast to angiosperm seeds which are enclosed inside of a carpel). The modified leaves on which the seeds are exposed are often structurally arranged in cones (strobili). Exceptions include Cycas spp. megasporophylls (see below). The megagametophyte (female gametophyte, n) develops from the functional megaspore (n) within the nucellus (2n, megasporangium). The megagametophyte (n) of gymnosperms are homologous to the megaprothallium (n) of the Pteridophytes and is sometimes also called primary endosperm (n). The megagametophytes (n) of gymnosperms produce several archegonia (n) with egg cells (n). As a result, more than one egg may be fertilized, and several embryos (2n) may develop within a single ovule. Polyembryony of gymnosperm seeds is a known phenomenon. In most cases only one embryo survives and therefore relatively few fully developed gymnosperm seeds contain more than one embryo. In contrast to seedless plants, water is not required in gymnosperms (and angiosperms) as a transport medium for the pollen to reach and pollinate the ovules. In the gymnosperms, the partly developed microgametophyte (male gametophyte, n), the pollen grain, is transferred by the wind to the vincinity of a megagametophyte within an ovule. This pollination process is via the micropyle, an opening in the seed coat (integument, 2n). The microgametophytes (n) of gymnosperms (and angiosperms) do not form antheridia. The gymnosperm groups differ in their pollen grains, pollination support structures, sperms and the fertilization process. Bennettitales (cycadeoids) are an extinct gymnosperm clade that formed a major componnt of the Mesozoic vegetation worldwide. They have been implicated in the origin of the angiosperms and the Gnetales. Important Bennettitales genera are Cycadeoidea, Bennettites and Williamsonia. The Cycadales (cycads) are an extant ancient group of seed plants and includes the Cycadaceae (Cycas, "sago palms") and Zamiaceae (Zamia, Ceratozamia, Dioon). They are palmlike or fernlike seed plants and are a minor component of the flora in tropical and subtropical regions today. The Bennettitales and Cycadales first appeared in the Triassic and early Permian, respectively, and dominated many parts of the world during the Jurassic period (206 to 144 MYBP). For this reason the Jurassic is often referred to as the "Age of Cycads". Great plant-eating dinosaurs roaming the earth, feeding on lush growths of ferns and palm-like cycads and cycadeoids, and smaller but vicious carnivores stalking the great herbivores, ... this was "Jurassic Parc". The Bennettitales and the dinosaurs became extinct towards the end of the Cretaceous; the Cretaceous period (144 to 65 MYBP) was characterized by the rapid radiation of the angiosperms beginning in the wet tropics. The Bennettitales were proposed as possible flowering plant ancestors because of their flower-like bisexual reproductive structures. Fossils of Bennettitales showed seeds arranged on specialized sporophylls. Bennettitales seeds (see figure above) harbored developed embryos. Typical features of these seeds were a long micropylar tube and a testa that was often composed of different layers, e.g. endotesta and sarcotesta. Some of these features are also evident in Cycadales seeds (see figure below). The Cycadaceae and the Zamiaceae are the two families of Cycadales. Cycad reproductive organs are primitive. The megasporophylls (ovule-bearing leaves; see figure on the right) of Cycas spp. do not form a determinate female cone, female plants produce successive and repeated zones of vegetative leaves, cataphylls, and megasporophylls. Each megasporophyll has a petiole, expanded at the distal end into a terminal blade, which is serrated or lobed. The serrations or lobes are suggested to be the equivalent of the leaflets of foliage leaves. The ovules are attached to both sides of the petiole. Megasporophylls of Zamia spp. and Dioon spp. are aranged as cones. The short and thickened microsporophylls (pollen-bearing leaves; see figure on the right) of male cycad plants are organized spirally in a compact cone (or strobilus). The microsporophylls are much less leaflike than the megasporophylls. The Cycadales seed is encased by integuments, the testa, which is usually organized in several layers (see figure above). In the ovule (unripe, unfertilized seed) the micropylar opening produces a liquid pollination drop which catches wind-blown pollen and allows it to enter the pollen chamber. Afterwards the spout of the nucellar cap grows into the micropyle and hardens; by this the pollen chamber is closed to the outside by nucellus tissue. 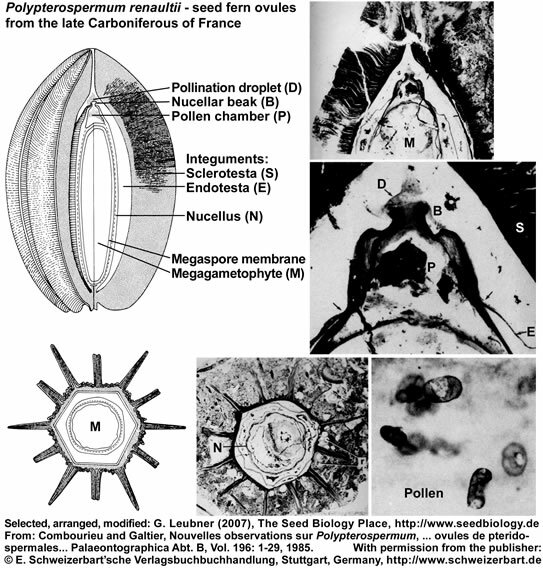 The pollen germinate within the pollen chamber and the pollen tubes grow in a haustoria-like manner into the nucellus tissue. The nucellus tissue desintegrates and the archegonial chambers form and later merge with the pollen chamber. The archegonia harboring egg cells develop within the female gametophyte (megagametophyte, megaprothallium, primary endosperm) and are located such that they are in open connection with the merged archegonial/pollen chamber. The pollen tubes release spermatozoids (n) which swim using their cilia to the archegonia. The spermatozoids enter the archegonia and fertilization of the egg cells generate one proembryo in each archegonium. About half a year time difference is often found between cycad pollination and fertilization. The proembryo develops into the embryo by growth and differentiation, while the immature seed develops into the mature seed. The mature seed is 1 to 6 cm in size, round or egg-shaped, and the testa (seed coat, integuments can be devided into an outer fleshy layer (sarcotesta) and an inner stony layer (sklerotesta). The nucellus forms a "papery membran" and at the micropylar end it is structured as a nucellar cap with a spout. The embryo is located within the megagametophyte tissue (sometimes called primary endosperm, n), which also harbors rests of the suspensors and rests of undeveloped embryos. Polyzygotic polyembryony is a common phenomenon within the Cycadales, but in most cases only one embryo develops. Morphological dormancy (MD): The embryo grows within the seed, and germination can occur only as the embryo has reached a similar size as the seed. The embryo usually has 2-4 fleshy cotyledons, a short hypocotyl, and a suspensor. The radicle is usually not fully developed as a distinct organ at the time of seed maturity. Nondeep simple MPD is found in seeds of tropical and subtropical Zamia species require many months of warm stratification before they will germinate. Seeds of Cycas spp. ("sago palm") contain 20-30% starch, which becomes only edible after removal of toxins (poisonous neurotoxins like BMAA (beta-methylamino-L-alanine) which acts as antagonist of glutamate receptors). 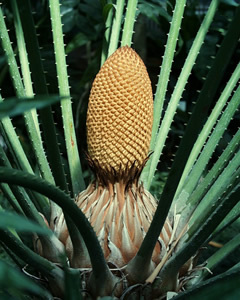 The cycad seed coat (integuments) consists of three layers: the fine inner endotesta, the middle ridgid sclerotesta, and the outer, typically fleshy sarcotesta. The sarcotesta becomes fleshy and edible to some animals, is often brightly colored to signal that it is 'ripe', and appears like a 'gymnosperm fruit'. Insect pollination (weevils, beetles) is common. (1) Pollen cones (male cones, pollen-bearing cones, male stroboli) with microsporophylls and microsporangia that contain numerous microsporocytes undergoing meiosis to produce haploid pollen grains. Each pine pollen grain is the immature microgametophyte (2n), and has two air sacs that function as "wings". The yellowish pine pollen is produced and dispersed by wind in spring. (2) Ovulate cones (female cones, ovule-bearing cones, seed cones, female stroboli) with megasporophylls that produce ovules ("Samenanlagen"). The pine megasporophylls are modified leaves called ovulate scales or ovuliferous scales. Each ovulate scale forms two ovules. Each ovule contains a single megasporangium (nucellus, 2n) with a single megaspore mother cell (megasporocyte, 2n), surrounded by integument tissue (later becomes the seed coat of the seed) produced of the sporophyte. Pollen grains can enter through a small opening in the integument, called micropyle. Pine pollen cones are simple cones, they consist of microsporophylls that are spirally arranged and are attached directly to a central axis. Conifer ovulate cones are often compound cones which consist of seed-scale complexes, also known as bract-scale complexes. Each seed-scale complex includes a sterile bract and an ovulate scale, which bears two ovules on its upper surface. Other conifers don't produce woody seed cones. For example, yew (Taxus) produce ovules at the tips of short axillary shoots. Each ovule is at least partially surrounded by a fleshy, cuplike covering called an aril. In yews, the aril is bright red and open at one end. The seeds with their fleshy arils are produced only on female yew plants, while pollen cones are produced on male plants. The scales of juniper (Juniperus) seed cones are fleshy at maturity and the cones look like berries. The genus Pinus has the longest fossil record of extant Pinaceae, extending back to the Jurassic or early Cretaceous. Pinaceae include the longest-lived trees: intermountain bristlecone pine (Pinus longaeva), an alpine species of the southwest United States, lives for almost 5000 years. 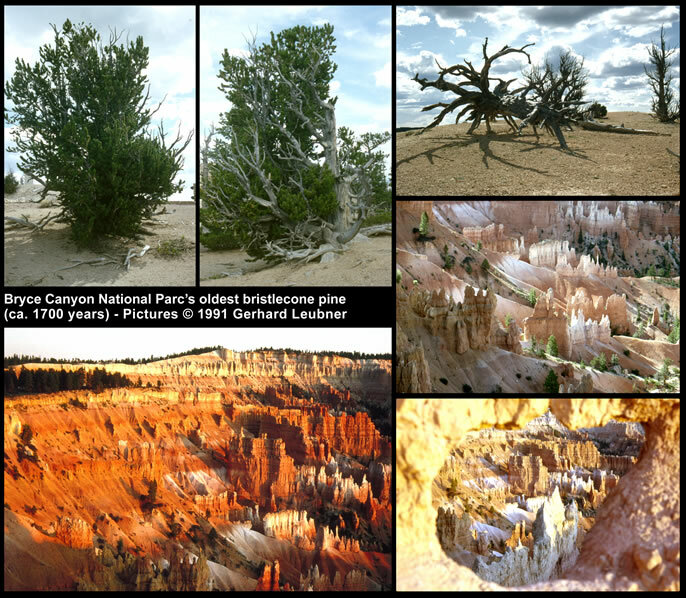 The figure on the right shows pictures of bristlecone pines in Bryce Canyon National Parc (southwest USA). The ones shown are approximately 1700 years old. On well-drained limestone ridges exposed to the most desiccating winds, bristlecone pines maintain a tenacious hold of life. Through the centuries of bristlecones life, the Bryce landscape changes. Erosion shapes the limestone fairyland. Hundreds of years will pass before the bristlecone deadwood disappears. Pollination:	Wind-blown	pollen grains land on drops of fluid produced by the ovules on the ovulate scales (see figure below). As the pollination drop of an ovule evaporates, several pollen grains are brought through the micropyle into contact with the megasporangium (nucellus, 2n), where they germinate. A germinating pine pollen grain (mature microgametophyte, n) contains four haploid nuclei, one of which will later fertilize the egg. In contrast to cycads and gingkos, conifers and gnetophyte ovules do not have pronounced pollen chambers and pollen grains do not release swimming spermazoids, but immobile sperms. Conifer ovule	development and fertilization: Pollen germination stimulates megagametophyte development within the megasporangium (see figure below). The single megaspore mother cell (megasporocyte, 2n) undergoes meiosis and forms four haploid megaspores (n). Of these only one megaspore survives (functional megaspore, n) and becomes the megagametophyte (n). When the megagametophyte matures, which takes about one year in pine, two to five archegonia each with one egg (n) develop within the megagametophyte close to the micropyle. The development of archagonia is typical for nearly all gymnosperm ovules (including Ephedra of the Gnetales group), but is not evident in angiosperms and not in Welwitschia and Gnetum of the Gnetales group. It takes about a year for the germinating pine pollen grains to mature and grow into the megasporangia with their pollen tubes. Fertilization of the egg in each archegonium is achieved by one sperm nucleus. Nourishment of the embryo during it's development is achived by the megagametophyte. Since often multiple pollen tubes grow and multiple archegonia are fertilized, more than one embryo develops. This initial polyembryony is typical for gymnosperms, but in most cases only one embryo survives and grows. Pine seed: The mature pine seed contains an uncurved embryo with many cotyledons. The embryo is embedded in a nutritional tissue which is megagametophyte (n) tissue. This is haploid maternal tissue and is by some researchers called primary endosperm (homolog of the megaprothallium). The diploid nucellar tissue is usually obliterated. The diploid integument tissue develops into the seed coat. The ovulate pine cone becomes woody as it matures. The scales grow and remain closed while the cone matures. Seeds are shed the second autumn after pollination. Pine seeds are winged, which aids transport by the wind (the wing is maternal tissue of the seed coat and the ovulate scale). 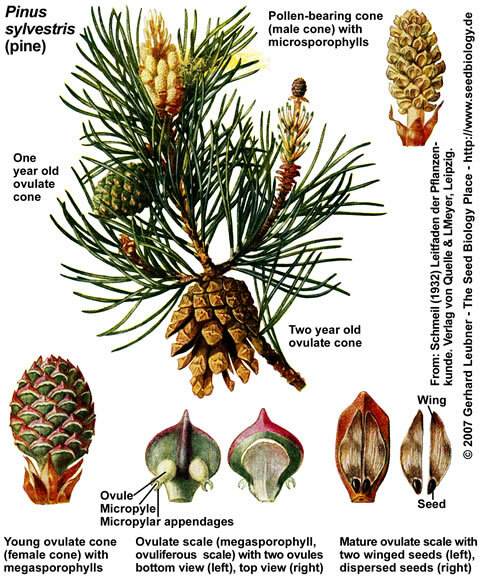 Some pine species require heat for cone opening and seed release, in other pine species animals open the cones, eat the seeds and distribute them.